An essential basic! 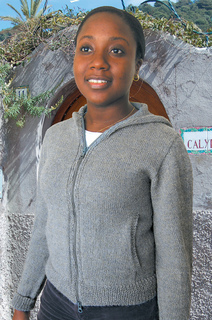 Hoodie with zipper closure is worked in one piece with shoulder seams - pockets optional. Sleeves are worked in rounds from shoulder to cuff. For a looser fit make one size larger. It will fit older children as well. This is an easy project to make without pockets and shoulder short row shaping; with pockets and shoulder shaping the skill level is intermediate - instructions for both included.